Are Cookbooks a Thing of the Past? #AtoZChallenge - A Rose Is A Rose Is A Rose! My husband KG, is passionate about cooking and eating good food. After marriage when he realized that I could barely cook, he gifted me The Fool Proof Cookbook: For Brides, Bachelors & Those Who Hate Cooking. This book was my friend, philosopher and guide in the kitchen. As I moved from a novice to cook, KG moved ahead from a cook to a chef. During this journey, cookbooks have been our constant companions. 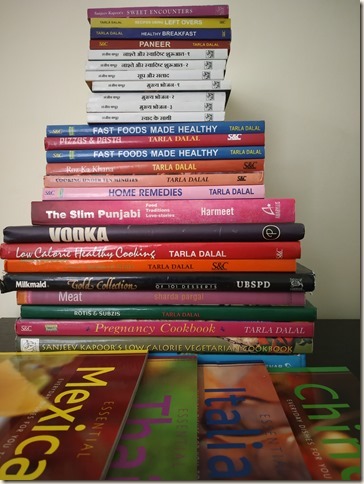 We both love cooking new recipes from cookery books and today we have more than 50 cookbooks in our book cupboard. Today, the amount of information that is available at a click of button is astounding. With growing number of food blogs, articles, online food publications and youtube channels, the ease of accessing recipes is simple and easy. So, are cookbooks a thing of past? 1. When you are not sure of what you want to eat and cook, flipping through a thoughtfully curated collection of recipes in a cookbook gives that much needed inspiration. 2. Cookbooks are great for daily/weekly/monthly meal planning. With meal planning, you eat better, healthier food, do more cooking for yourself and put more thought into what you eat, and try new recipes too. Cookbooks have recipes divided into various courses, cuisines, seasons, types of cooking, category of foods, etc. So, you can pick recipes which suit your taste and foods that matter to you. 3. You can add your notes, twists or variations that you have explored, in the margin of the book for future reference. And who knows, that your version of the recipe is loved and cherished by the next generation! 4. Unlike the online recipes, recipes in the cookbooks are written by chefs or food professionals, so the recipes are tried and tested and well curated. The other day, I looked at a cake recipe by a famous food blogger and I felt that the quantity of baking powder was a bit too much. But the number of comments that said, “Fabulous recipe! My cake turned out great”, made me go with the shared recipe. And predictably, the batter rose rapidly and collapsed and the cake tasted bitter. 5. While cooking, you don’t have to go back and forth to the laptop or small screen of the phone to look at the recipe. A cookbook propped up on the kitchen counter or dining table is easy to access and refer to from time to time. I am baised towards cookbooks for these reasons. What about you? 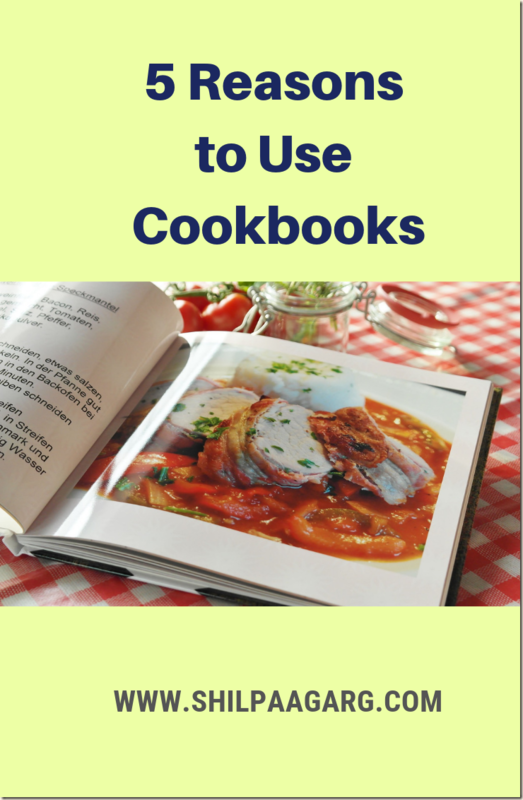 Do you love using cookbooks or online recipe resources? Recently Youtube cooking Videos are making everything easy. I agree with your points about Cookbooks. I have few in lying on the shelf. I should start looking into them. 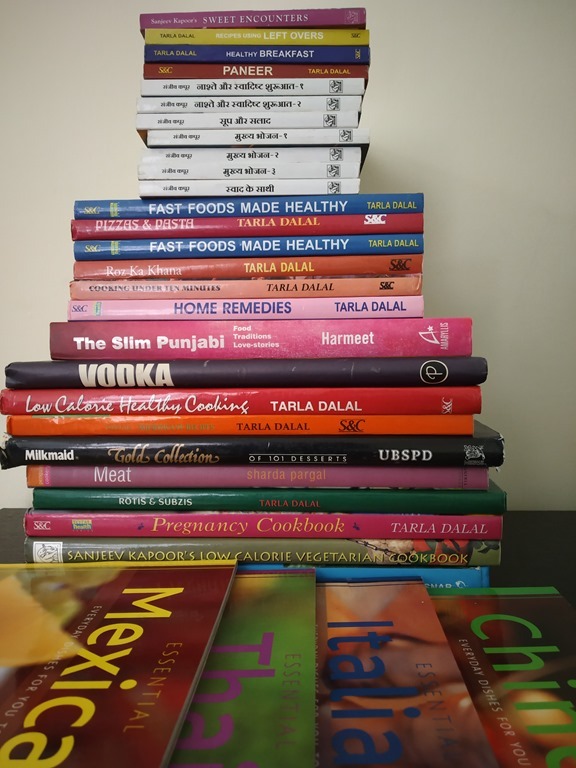 My son loves collecting cookbooks but he does indeed find very useful guidance from videos on YouTube which help for example with seeing what people mean when they describe consistency or colour at various stages of the cooking process. I love cookbooks. But they are becoming a thing of the past, with lot of videos in Youtube. I prefer my cookbooks over YouTube videos. I like to watch a video to get a better understanding of how to do something, but I need a written recipes to follow. I have 2-3 dozen cookbooks and use my Betty Crocker the most. It’s around 50 years old. I agree cook books are never going to go out of vogue. Even if one looks at a recipe over the net, they still need to take print out. Eventually a stack of printouts becomes as good as a book. I also agree, a menu suggested by a chef is likely to be a generic menu on the net. So books are here to stay. For me, honestly, cook-books are passe. I prefer YouTube on cookbooks any given day. Have tried following recipe via cookbooks I often goof-up. But on videos, just pause to look whats the real quantity etc. Plus Kavya is the one who helps me with maneuvering the videos, so I am sorted. I had a few cookbooks that I never used. Recently I have them all away. I prefer to look at food blogs and videos when I am searching for something. I must confess that I have never used a cookbook. I learnt all my cooking from following Recipes online. I find using a cookbook cumbersome. I like cook books, because online, the recipes often get mixed up. You refer to a certain recipe before you plan to cook a particular dish, but when you go back to that recipe (and if you haven’t saved it), it just disappears. Cook books are better, for sure. I still prefer a cookbook over a youtube video! There is something so comforting about a recipe in a book. I have quite a large collection of them and I love going through them randomly even if I’m not looking for a particular recipe. This is exactly what I told my sister when I sent her some interesting cookbooks from amazon, ‘coz they are such big foodies na! But no… for them internet is God! Especially now, that you have so many youtube channels for food! Love to indulge my senses with a good cookbook. Virtual recipes can not replace the charm of holding a cookbook. Honestly, I never used a cookbook. I got one along with the food processor which is still untouched, lying in some corner of my kitchen. I prefer online recipes. My husband also is a foodie and like cooking too. I agree, these days no one buys cookbooks as it’s available online but I also love them. I have quite a few myself. I have a wonderful collection of cookbooks and can never resist buying ones that I see in second-hand book shops. But I have to confess to propping up my i pad when cooking if I need a recipe! However, having been a chef-patron for many a year, most of my favourite recipes are in my head – or I make them up as I go! Are cookbooks a thing of the past? Nope. I have a few cookbooks inherited from/gifted by female relatives which I cherish. No amount of online stuff can replace a book that’s been handled with love and has been making family memories for decades. I am not interested in cooking shilpa, its only after I got married I had to learn to cook as i was in a joint family, and had to follow the norms and accordingly I learnt but never really used a cook book. My daughter is fond of cooking, and she used to try reading recipe from books. 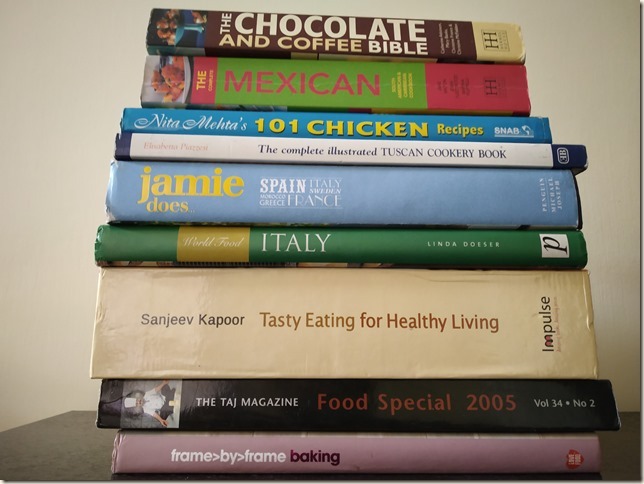 Over the years, my husband and I collected a LOT of cookbooks! But recently, we sifted through them and got rid of probably 2/3 of them because we either didn’t like anything we’d tried in them, or only found one recipe that was a “keeper” (and copied it onto a recipe card, rather than store the entire book). Many of the ones we got rid of were part of a series, or had unhealthy trends to the recipes like using “light” products with a bunch of chemicals, or cooking sprays, or whatever. No worries; we still have dozens on the shelves. That said, I think I use an equal amount of cookbooks and internet browsing for the recipes I want. I like having the cookbook sitting there for easy reference, and I like your thoughts on collections like main meals or desserts, all in one place to find. I do love the variety I can find online, though I am careful to read the reviews to see what the average person’s experience was. The reasons listed are compelling to use cookbooks. I have a few cookbooks of sattvic food recipes. But we always want to try recipes other than the staple diet and cookbooks can surely be of help. Even I have a good load of cookbooks but agree this web space has spoiled me. But as in other books, I still love the smell of paper. Have good loads of cookbooks but agree online search has spoiled me, but the smell of paper and the feel of the book makes me buy more.